A London South Bank University (LSBU) debate saw Jackie Smith, Chief Executive of the Nursing and Midwifery Council, and Peter Carter, former Chief Executive of the Royal College of Nursing discuss the purpose of health regulation and the benefits and challenges that it brings. The intent was to reflect on the current state of the regulatory framework for healthcare professionals in Great Britain, and to examine whether the benefit of the current stringent system has a justifiable impact on protecting the public. The event was chaired by Professor Warren Tuner, Pro Vice Chancellor and Dean of the School of Health and Social Care at LSBU. “Healthcare professionals are required by statute to register with either the General Medical Council (GMC), the Nursing and Midwifery Council (NMC) or the Health and Care Professions Council (HCPC). In the case of the GMC and the NMC they must revalidate at regular intervals. When a practitioner’s fitness to practise is questioned, there can be lengthy delays in considering their cases. Jackie Smith highlighted the need to agree on the real purpose of regulation to achieve a meaningful reform. 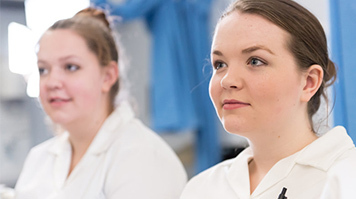 Find out more about our series of health debates and about studying at LSBU’s School of Health and Social Care.